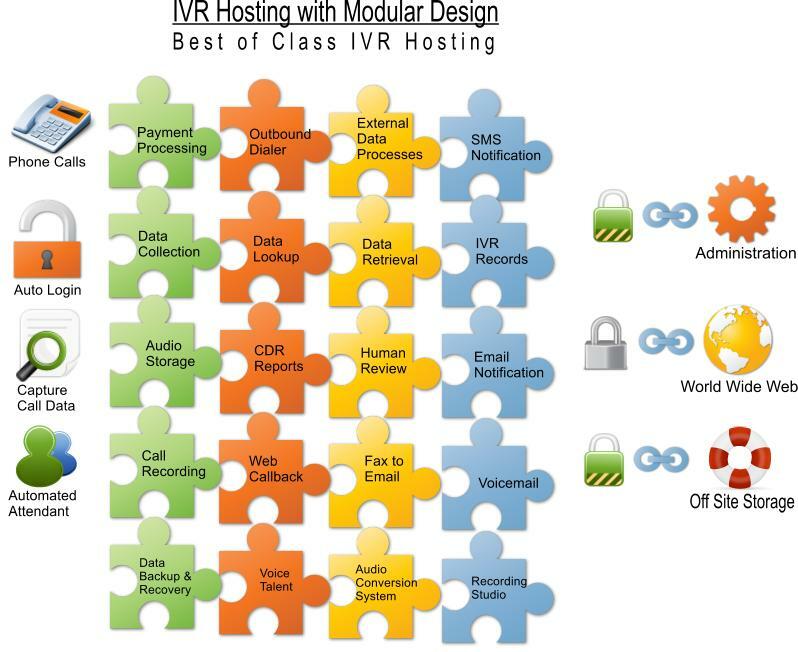 We currently offer 6 different Hosted IVR Platforms in the Cloud. Some call it Hosted IVR, IVR Hosting, Cloud Computing, Software as a Service, whatever you call it, the idea is the same, no hardware or software to purchase or maintain. This means you can focus on your business, sit back relax while we do what we love, build and maintain our IVR Hosting Applications that make our customers rich. Full service means you tell us what you want and we make it happen. Connect your business data to our Hosted IVR platform and give your customers the information they need in real-time. 6 HOSTED IVR PLATFORMS AVAILABLE! Your Hosted IVR services can be completely customized as needed to fit your needs. Based on your needs we will setup your hosted IVR service on one or more of our six different hosted IVR platforms. If you are setup on 2 different platforms each with a different carrier...this gives you a total carrier backup and complete system redundancy. If primary platform is down, you can instantly switch to your backup platform. Both systems are connected to IVR database so all your data stays in one place under the same login. This give you and instant real-time failover for mission critical applications. Premium Hosted IVR services without breaking the bank. We provide professional voice talent and script writing services for all of your Hosted IVR projects. Voice Stamps Hosted IVR Platform and supports unlimited languages. We offer bot male and female English and Spanish voice talents on staff, other languages may require outsourced voice talent. To start your own hosted IVR business give us a call. We specialize in Custom Hosted IVR and support large Custom IVR projects that require real-time data exchange back and forth. We will show you how to integrate our Hosted IVR Platform into your custom software application. We can assist you with the custom application development and show how you to integrate your software application into our Hosted IVR Platform using a simple API interface.